Oceans are experiencing both warming temperatures and increasing acidification. Rising oceanic carbon-dioxide levels lead to a decrease in pH, resulting in a phenomenon called ocean acidification. These physicochemical changes are expected to impact ocean species to varying degrees. Changing conditions are occurring in the habitats of many fish species, and understanding their impact is of the utmost importance so that we may determine the fate of fish and their current ecosystems in future oceans and adapt accordingly. Atlantic cod (Gadus morhua; Fig. 1) distributions are shifting northward concurrent with rising sea surface temperatures, along with many other fish species in the west Atlantic Ocean. This new northern habitat shift overlaps with the habitat of Polar cod (Boreogadus saida; Fig. 1). Polar cod are Arctic fish that primarily prey on larger plankton, whereas Atlantic cod are temperate fish that primarily prey on crustaceans and other fish. One group of researchers decided to take a look at which species will cope better with future conditions that include this new overlap in habitat by investigating each fish’s performance under future conditions using experiments. Researchers set up laboratory experiments to investigate this question further. They simulated different warming and acidification (390 and 1170 µatm) conditions that may occur in our future ocean: 0, 3, 6, 8 °C for Polar cod and 3, 8, 12, 16 °C for Atlantic cod. Growth, food consumption and metabolic rate were monitored for 4 months (Fig. 2). Figure 2. 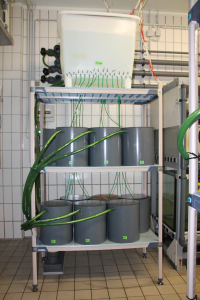 Photograph of the experimental setup (Kristina Kunz). Atlantic cod displayed increased growth performance in warming conditions (meant to simulate a warming Arctic), even with elevated pCO2 conditions. The researchers hypothesized that this was due to a wide range of abiotic conditions that Atlantic cod experience in their lifetime that Polar cod do not experience to the same degree. Polar cod mortality occurred at 8 °C, indicating that this was the long-term upper thermal tolerance limit for these fish. Polar cod growth also displayed a higher sensitivity to pCO2 levels. This led to the conclusion that the competitive strength of Polar cod is expected to decrease as future oceans become warmer and more acidic, while Atlantic cod performance increases. Overall, the authors suggest that rising temperatures are the predominant environmental factor that is leading to shifts in performance of fish in ocean habitats. There are other temperate fish species besides Atlantic cod that are extending their distribution north such as capelin and herring, and competition with these fish species may lead to future competitive impairment of Polar cod. This movement of fish northward may also lead to fishing vessels heading to Arctic waters that were previously inaccessible due to ice cover, further stressing the Polar cod. Kunz, K. L., Frickenhaus, S., Hardenberg, S., Johansen, T., Leo, E., Pörtner, H. O., Schmidt, M., Windisch, H.S., Knust, R., Mark, F. C. 2016. New encounters in Arctic waters: a comparison of metabolism and performance of polar cod (Boreogadus saida) and Atlantic cod (Gadus morhua) under ocean acidification and warming. Polar Biology, 1-17.